In the 5 years before 1987, more than 110 drivers and motorcycle riders who lost their lives each year had a BAC greater than 0.05g/100ml. This has reduced to an average of 28 drivers and riders who lost their lives each year with a BAC greater than 0.05g/100ml from 2011-2015. In 2016, there were 34 drivers and riders who lost their lives with a BAC greater than 0.05g/100ml. 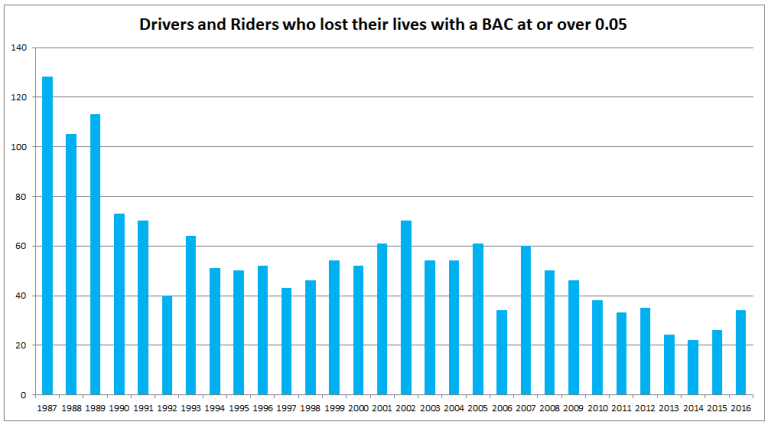 The proportion of drivers and motorcycle riders who lost their lives with a BAC greater than 0.05g/100ml has declined from 38% in 1987 to 19% in 2016. Since 1997, Victoria Police have breath tested more than 24 million drivers and riders from Booze Bus operations, catching more than 75,000 drivers and riders with an illegal blood alcohol concentration (BAC) during this period. The vast majority (99.7%) of drivers tested do not exceed their legal blood alcohol levels, however, in the last 5 years, close to 1 in 5 drivers and riders who lost their lives had a BAC greater than 0.05. The majority (99.7%) of drivers tested did not exceed their legal blood alcohol levels, however, close to 1 in 5 drivers and riders who lost their lives in the last 5 years had a BAC greater than 0.05. See the TAC drink driving campaigns.